San Antonio Bay, Ibiza. Cool & stylish, Beach, Adults-only, Budget, San Antonio Bay, 4-5 Stars. 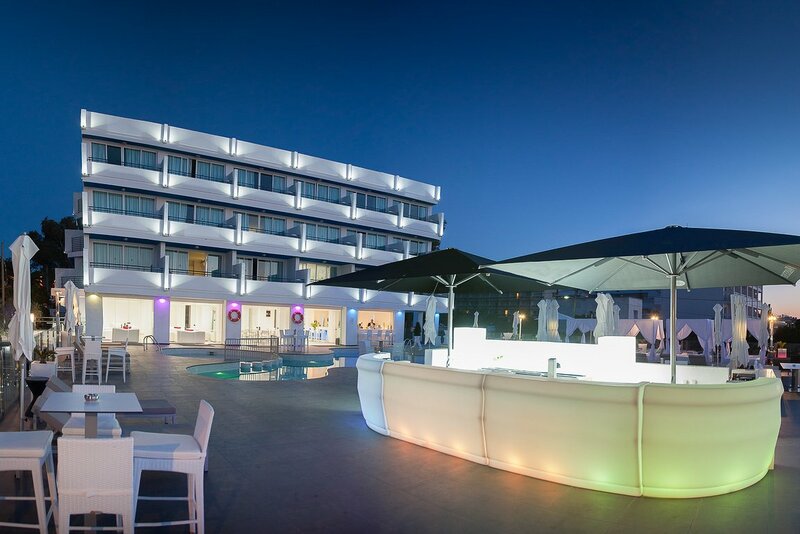 A bright and modern hotel, with breathtaking views of the sunsets and sea and in easy walking distance to the bars and clubs of San Antonio town. Marina Playa Hotel Apartments - Right by the sea in a tranquil location, you will be able to relax easily at these brightly-styled adults-only apartments. The excellent on-site restaurant offers a fusion of Mediterranean and international cuisine translated into simple, seasonal and slow-cooked fare. The chill-out terrace is just the place to unwind, sip a tasty cocktail, recline on a Balinese sunbed and take in the incredible colourful sunsets. Next to the stylish restaurant and lounge bar you will also find a pub that has an enormous range of different beers. Take an early morning dip in the inviting pool before your breakfast on the terrace, or wait for later and have one of their experienced mixologists bring you a frozen margarita or caipirinha. The gorgeous sunset terrace not only enjoys incredibly beautiful views of the bay and sunsets, but also offers a weekly programme of parties and events with DJs and live music. The apartments are in a relatively quiet location right next to the beautiful small sandy beach of Es Puet with the many amenities of San Antonio Bay's shops, restaurants and bars all very close by. The long main beach and the centre of San Antonio are a mere 10-minute walk along the tree-lined promenade, as is the nightlife with its pre-club bars, sunset bars and famous clubs. Plus, the disco bus connects all night long to the other super clubs of the island as well as Ibiza town and Playa d'en Bossa.